“Aaron’s design was just perfect. He really listened to our needs and we couldn’t be happier with the results. The business cards are professional, beautiful and exactly what we wanted." We contacted Aaron Anderson of AG Advertising to get a quote on some unique tent cards we were having difficulty getting made. We explained exactly what we needed to Aaron and he knew precisely what we needed. Within a day or two we received the copy to look at before approving it to go to print. Aaron’s design was just perfect. He really listened to our needs and we couldn’t be happier with the results. The business cards are professional, beautiful and exactly what we wanted.We appreciate your professionalism and vision and we look forward to working with you in the future. On tent cards, you have the ability to get these in many different sizes. Our most popular size is the business card size 3.5" x 4" folded down to a 3.5" x 2". This works for many areas including point of purchase counters and trade shows. 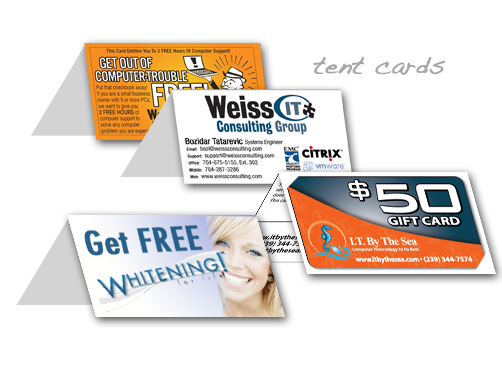 Have your tent card custom designed and printed to match your company's look. Custom design for the tent cards start reasonably priced at $149. 4 color front - BW back - 3.5" x 4"